Do you think Turkish wines have the potential to compete in the world markets with their quality and taste? Why? If so, why are they not known and appreciated more widely? Certainly. We have great wines, but also have two disadvantages. First, the consumption of wine in Turkey is very low. In other words, local demand doesn’t support the producers financially. Second, the wine imports to Turkey were very low for many years and when local producers were not competing in the local markets, they didn’t have to work as hard on improving their quality. However, in the recent years, many boutique producers entered the market and raised the bar. The larger and older producers started creating very high quality and impressive products. They also upgraded their technology and methods resulting in improved quality overall. Based on your research, what types of grapes are most prominent in the wine production in Turkey? Boğazkere and Öküzgözü grapes produce the highest quality wines in Turkey. Various blends using these grapes have produced successful results. Almost every mid to large size producer now has a Boğazkere -Öküzgözü blend. In addition, Turkish consumer loves Cabernet and Merlot and mostly in the recent years, Shiraz, with a preference for red wine overall. Is there any type of classification or appellation system in place or planned for the future, to organize and monitor quality standards? No, there isn’t. There was a geographic labeling system targeting Kalecik Karasi, but that didn’t gain much traction. The controls on labels are not sufficient. For example, there is no restriction or rule that requires for a producer to use Boğazkere at 75% if the product is labeled as a Boğazkere wine. How is the Turkish wine production progressing in terms of numbers compared to domestic consumption and how do foreign wine imports figure in the domestic market? The wine production in Turkey is somewhere around 1 liter per person and is not increasing. In many cities in Anatolia, there is not much of a wine consumption at all. As for imported wines, the ratio is quite low, with only 5% of consumption in foreign wines. But in the later part of 2009, the tax on wine imports has been lowered. These developments may increase our imports, which is probably good news for the consumers and bad news for the local producers. The local wines may drop in price, possibly increasing their consumption but not necessarily increasing the revenues for the producers. You also own a small vineyard yourself, Ergenekon Vineyards. What types of grapes/wines/production are you focusing on, in your own vineyard and why? In our vineyard, we have Cabernet Sauvignon, Merlot, Shiraz, Grenache, Cabernet Franc, Sauvignon Blanc and their qualitative clones along with a couple of experiments with a few unknown grape types. Our regions used to have indigenous grapes but over time they disappeared. Other local grapes from other regions of Turkey are not suitable for our microclimate. We think that the important thing is quality and not the type of grape. So we use organic and biodynamic methods. If you knew all the possible diseases and what it takes to fight all these environmental threats, and calculated the true return in production, you would think twice when you drink wine. Since we have always relied on local and organic produce in our life style, it was impossible for us to use any other approach in our wine production. Do you sell your wines commercially and internationally? At this stage, we do not produce at a commercial scale but only sell our fruit. Every year, our production increases and, our production volume for 2010 is expected to be around 45-50 tons, eventually stabilizing at around 60 tons per year. By law, home production of wine is limited to only 350 liters and sale of any such product is not permitted. So every year, we drink our own wine and give some of our production to our friends and family. We would like to eventually establish a small production facility as soon as we gather enough capital. For now, we practice with our 350 liters. 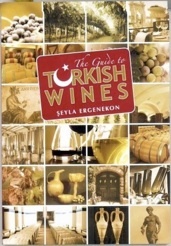 You have a few books you have written on the topic of Turkish wines. What was your process for researching this field? Do you have plans for other books in the future? I traveled a lot, visited many producers, and tasted their products. It is a very popular saying; good wines come from happy vines. If you had no controls in your vineyard and your vines were not happy, you cannot produce a great wine. Therefore during my research, I especially paid attention to the vineyards as much as the production facilities. In the future, I also plan to write more. With new producers and wines, I receive samples sent to me for tasting. I also need to keep working on my books “Turkish Wine” and “The Guide to Turkish Wines” to keep them up to date. Thank you Seyla for your insights. This interview was conducted by Meltem in Turkish and translated into English with permission. The photograph of Seyla Ergenekon was provided by Seyla Ergenekon and is also used with permission. As an author of two books on Turkish wines and the wine industry, Dr. Şeyla Ergenekon has a Master’s and PhD as an environmental economist. She grew up in a wine loving family and married a wine loving husband. Realizing lack of published information and consolidated research on the Turkish wine industry, she took on herself to study this field and educate others in Turkey. Her first book, Turkish Wines, published in 1999 was sold out in two months further confirming the need and interest for this kind of research. With her husband Çağatay, Şeyla later acquired and now operates a certified organic and biodynamic vineyard with a production volume approaching 45-50 tons, in the Gallipoli peninsula of Turkey. 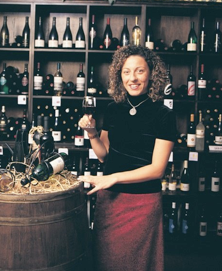 She currently works on a freelance basis as an environmental economist and is also the Founder and an active member of the Istanbul Wine Tasting Society. Biodynamic wines are wines made using the principles of biodynamic agriculture. Biodynamic agriculture is a method of organic farming with homeopathic composts that treats farms as unified and individual organisms, emphasizing balancing the holistic development and interrelationship of the soil, plants and animals. Biodynamic farming has much in common with other organic approaches, such as emphasizing the use of manures and composts and excluding of the use of artificial chemicals on soil and plants. Methods unique to the biodynamic approach include the use of fermented herbal and mineral preparations as compost additives and field sprays and the use of an astronomical sowing and planting calendar.